FPtr – Front post treble crochet – Yarn over 2 times, insert hook from front to back to front around the post of the corresponding stitch below, yarn over and pull up loop [yarn over, draw through two loops on hook] 3 times. BPtr – Back post treble crochet – Yarn over 2 times, insert hook from back to front to back around the post of the corresponding stitch below, yarn over and pull up loop [yarn over, draw through two loops on hook] 3 times. The beginning chain should be a multiple of 34 plus 29. Row 1: 2dc in 4th chain from hook, dc in next 5 ch, dc3tog (uses 3 ch), dc in next ch, skip 2 ch, 2 dc in next ch, ch2, 2 dc in next ch, skip 2 ch, dc in next ch, dc3tog (uses 3 ch) ** dc in next 5 ch, 3dc in next ch, dc in next ch, skip 2 ch, 2 dc in next ch, ch2, 2 dc in next ch, skip 2 ch, dc in next ch, 3dc in next ch, dc in next 5 ch, dc3tog (uses 3 ch), dc in next ch, skip 2 ch, 2 dc in next ch, ch2, 2 dc in next ch, skip 2 ch, dc in next ch, dc3tog (uses 3 ch). Repeat from ** across to last 6 chains. Dc in next 5 ch, 3dc last ch. Turn. Row 2: Ch3 (counts as a dc), 2dc in first dc, dc in next 5 dc, dc3tog in next three stitches, BPtr around next dc, skip 2 dc, (2dc, 2ch, 2dc) in next ch2 sp, skip 2 dc, BPtr around next dc, dc3tog in next three stitches, ** dc in next 5 dc, 3dc in next dc, BPtr around next dc, skip 2 dc, (2dc, 2ch, 2dc) in next ch2 sp, skip 2 dc, BPtr around next dc, 3dc in next dc, dc in next 5 dc, dc3tog in next three stitches, BPtr around next dc, skip 2 dc, (2dc, 2ch, 2dc) in next ch2 sp, skip 2 dc, BPtr around next dc, dc3tog in next three stitches. Repeat from ** across to last 5 dc and turning chain. Dc in next 5 dc, 3dc in top of turning chain. Turn. Row 3: Ch3 (counts as a dc), 2dc in first dc, dc in next 5 dc, dc3tog in next three stitches, FPtr around next BPtr, skip 2 dc, (2dc, 2ch, 2dc) in next ch2 sp, skip 2 dc, FPtr around next BPtr, dc3tog in next three stitches, ** dc in next 5 dc, 3dc in next dc, FPtr around next BPtr, skip 2 dc, (2dc, 2ch, 2dc) in next ch2 sp, skip 2 dc, FPtr around next BPtr, 3dc in next dc, dc in next 5 dc, dc3tog in next three stitches, FPtr around next BPtr, skip 2 dc, (2dc, 2ch, 2dc) in next ch2 sp, skip 2 dc, FPtr around next BPtr, dc3tog in next three stitches. Repeat from ** across to last 5 dc and turning chain. Dc in next 5 dc, 3dc in top of turning chain. Turn. Row 4: Ch3 (counts as a dc), 2dc in first dc, dc in next 5 dc, dc3tog in next three stitches, BPtr around next FPtr, skip 2 dc, (2dc, 2ch, 2dc) in next ch2 sp, skip 2 dc, BPtr around next FPtr, dc3tog in next three stitches, ** dc in next 5 dc, 3dc in next dc, BPtr around next FPtr, skip 2 dc, (2dc, 2ch, 2dc) in next ch2 sp, skip 2 dc, BPtr around next FPtr, 3dc in next dc, dc in next 5 dc, dc3tog in next three stitches, BPtr around next FPtr, skip 2 dc, (2dc, 2ch, 2dc) in next ch2 sp, skip 2 dc, BPtr around next FPtr, dc3tog in next three stitches. Repeat from ** across to last 5 dc and turning chain. Dc in next 5 dc, 3dc in top of turning chain. Turn. Repeat rows 3 and 4 until afghan is desired length. Finish off and weave in end. 3/7/19 – added “first” after “2dc in” at beginning of each row. I love this you are so very talented! oh my gosh! i love this! Thank you so much for posting it. I’ve got a baby blanket to make and this pattern is IT! This is a lovely blanket and you stated it perfectly “…with a classy finished look”; the post stitches are wonderful for this kind of pattern . Thank you so much for sharing them with us. I have always liked the Ripple Afghan, but I really love the twist you have given this one. I’ve had a problem with the Ripple wanting to curl at each peak, and vally, but it looks like this pattern will solve that. Keep up the great work, let your talent fly. I loe both patterns. But this ripple is my favorite with the shell and the post stitch. is a lot different. I love these colors! Can you share? I made it with Knitting Fever King Tut. The colors are 350 and 344. I just love this pattern , I made one and now i am going to make one with out the ripple. thank you so much for a great pattern !!! Thank you for this beautiful pattern. I have made it in Teal, Aqua, and Cream in row sections of 6 and 4. I would like to add a border/trim, but I don’t want to take away from the pattern do you have any suggestions. Again thank you for sharing this pattern. Three rows of single crochet in one color or one row of sc in each color. You could also do on row of sc then shells all around. Your colors sound lovely. This is absolutely beautiful. I was looking for a pretty pattern to do for a Christmas gift. THIS IS IT! Are you only crocheting in the back stitches? I started this pattern but I am not getting the neatness of that cute line, so is that back stitches only? I made the example working in the front loops only (which is, of course the back loop of the previous row, but it is in the front after turning). Could you show how to do a post stitch please? I just found this video which demonstrates the type of post stitch that is also in my pattern. Let me know if this doesn’t help. Hi I love the design of this pattern and I am not an expert. On the row 1, the last 6 chains…I am doing Medium size with 165 chains…I think I did count it right, I did what you said on row 1, the last 11 chains are dc in next 5 chains, then I do 5 chains and 3dc in last chain. OK so I turn, proceed to row 2, what is a BPst around next dc? then (2dc, 2ch, 2dc) in next ch2 sp? That 2ch sp is farther away…how do i do this please. I think I may know the problem. When you get to the end of the repeated section you really should have 6 chains left. Since you have 5 extra, it is something that happened once in each repeat. It may be the shell. In the first row, the shell should take two chains. The first 2dc are made in one chain, then ch 2, then the last 2 dc of the shell are made in the next ch. If you made the whole shell in one chain it would explain the extra five chains at the end. x-large pattern. I would like to know how to work this seeing that I’d like to evenly spread the smaller amount of yarn color throughout the project. Am I seeing a valid concern here?- not wanting to run out, get the size I want, even spread of color… all from not having a guage?? I actually have another question after all that :):)! Any recommendations as to how to figure the spread of the much lesser color?? I sure went long on this but I hope it was clear and would love some understanding on how to look at qauge and color dividing. So appreciate your help and work. My gage for double crochet for a 4″ square is 16 stitches and 7 rows. Based on my gage for the extra large size, each row would take 26.68 yards. You would have enough color A for 43 rows and enough color B for 147 rows. Dividing it up depends on how stripy you want it. I put together a spreadsheet with a range of numbers of bands. This is assuming color B is the first and last band so will have one more band than color A. I can adjust these calculations if you need a different gage. thank you much for the speedy reply and helpful info. Hello. This is my first time doing a crochet project of this size and I am truly excited. I am in love with this pattern, however I am confused. In Row 2 you state “BPst around next dc, (2dc, 2ch, 2dc) in next ch2 sp, skip 2 dc, BPst around next dc,” my issue is when I get to the first BPst I have 2dc there. So I just ignore that other dc just before the ch2 sp? Or do I BPst around the 2dc? You skip the 2 dc before the ch2 sp. The 2 dc before and after the ch 2 sp form the shell and you will always work a shell in the ch sp of the prior shell and not work in the dc of the shell. I am so happy you are using this pattern for your first big project. I know it will be beautiful. Hi there! I am stuck on the beginning of row two… i did ch3, 2dc, dc in next 5 dc. Now if i bptr i am at the first dc at the beginning of the shell. If i put the bptr there then there is one more dc, then the ch 2, then the 2 dc… so where do i go from here? The end of row 1: 2 dc in next ch, ch2, 2 dc in next ch, skip 2 ch, dc in next ch, dc3tog, dc in next 5 ch, 3dc last ch. Turn. Row 2: Ch3 (counts as a dc), 2dc in dc (this is in the first dc), dc in next 5 dc (2 of these are in the 3dc and 3 in single dc), dc3tog in next three stitches (so now this uses the last 2 single dc and the dc3tog), BPst around next dc (this is around the single dc between the dc3tog and the shell), (2dc, 2ch, 2dc) in next ch2 sp…. My best guess would be that you may have put your 2 dc in the second dc instead of the first. They should go in the first to basically form a 3 dc by counting the ch3 as a dc. Thanks for replying back so quickly! I think I got it now, I’ll let you know if I need more help (im kind of new at crocheting) Im very excited for this blanket! Your picture is so beautiful I hope mine turns out as good! do I skip those and go to the 2 chain stitches. Skip those and put the (2dc, 2ch, 2dc) in the ch2-space. That was causing confusion, so I’ve updated the pattern to make it clear that those two dc are skipped throughout. I started this pattern last night and when I got to the end of Row 1, I could not finish the repeat pattern and end up with 6 chains. I’m curious, in two instances, you state that the dc3tog uses 3 chains, and in the other two instances, the direction of using 3 chains is left off. In that case, will the dc3tog be in the came chain space, using only one chain, or does the dc3tog always use three chain spaces? Thanks for your time and your amazing patterns! The dc3tog always uses three stitches (chains in row one). I’m so sorry that was confusing. I updated the pattern to clarify that each instance of the dc3tog uses three stitches. Thanks! I’m sure I must have repeated a line without noticing. I’ll get it tonight, I’m determined. I love this pattern but I am having a bit of trouble…on row 2 after the bptr stitch and sk 2dc I have 12 dc to get to ch space for shell stitch. I have started over 2 times to make sure my count is right. Please help! When you completed the first row, did it work out so that when you got to the last 6 chains, you had completed a repeat? I had 1 extra space. I did complete the repeat but had 2 chs left and I did a dc in both chs. Something is going on with row 1. It should work out exactly so that at the end of the last repeat you are at the last 6 chains and can work the last stitches after the repeat. A common mistake is using one chain instead of two for the first row shells. I kept working it and finally got it right! I am so happy…getting ready to start row 4. Thank you for this site and the help! That is working the extra small size. I will try it again. I also cross stitch and am usually very careful with my count. I absolutely love crocheting this pattern…it is fun for me! Good catch! Sorry about that inconsistency. I changed all the references for the two special post stitches to FPtr and BPtr. Great pattern and so many possibilities for color choices. But what I REALLY appreciate is the size/yarn quantity chart. I crochet for several charities and each requires different size afghans. What a time saver this will be for me in determining how much yarn I will need Thanks for posting this! What a beautiful afghan. Maby I’ll use this pattern instead of the zig zag one I had in mind. If you’d point me to one or more of these tutorials I’d be glad to take a look and give my opinion. Thanks! These printing options take up way too much space, and waste lots of paper. Otherwise, the patterns are very nice. If you select the printer icon at the top of the pattern, it will make a clean copy without comments. You can also delete the pictures or any other sections you would like to delete before printing so that you don’t waste paper. Absolutely. It would work great. I started this afghan on row 3 but I don’ have that ridge like it is in the picture, I checked the pattern buy what am I missing? Also how many rows of gray do you do before you change colors? I know I can change colors anytime, but really like your pattern. Thanks for your help, much appreciated. I started this afghan and am on row 3 but I Don’t have the ridges like it is in picture. I checked the pattern, but what am I missing? Also could you tell me how many rows of gray and pink you used before you change colors? I know you can change anytime, but really like your pattern. Thanks for you help, much appreciated. Love your blog, plan to make other things you offer. If you are talking about the horizontal ridges, not the vertical ones, that is from crocheting through the back loops only, not both loops. I make 10 rows per color for the stripes. I made it in brown and red/orange ombre and it is beautiful: http://ravel.me/CherryYarn/sapsra. I used charcoal, bright green, pale yellow, bright orange and white. Made this for a young lady who’s been battling health issues for the last 3 years. Hope she likes it! Wish I could attach a picture. Sorry. Here is a photo tutorial I found. Does that help? This a beautiful pattern… my kids all want one!!! The one I have in the picture has color stripes of 10 rows, but I have seen others make it with stripes that aren’t as wide. You also don’t have to make the stripes equal width for the two colors. If you have an idea of your stripe width plan, I will be glad to calculate your yardage by color. I haven’t made it with two strands but I would think it should work fine. Hi! Here I am in my early 50s teaching myself to crochet. I got to row 2 at the end and am puzzled by the “5 last dc and turning chain.” Im to put dc in next 5 dc and 3dc in top of turning chain. What the devil is the turning chain? I dont remember it from row 1. Please be as gentle and clear with your answer to me as you have been to the previous writers. And thank you for this pattern. I’m guilty here of using a sort of short cut lingo, that I’m taking for granted is general known, but doesn’t mean it is always. In general a turning chain is at the beginning of a row looking at that row from the direction it was made, or working on top of that row from the back, it then is at the end. It was made when you had to chain 3 or some other number at the beginning of the row to get up to the level of the next row, and often counts as a stitch. It is called a “turning chain” because it occurs at the point you turn the work to start on the next row. Now on row 1, the turning chain isn’t caused by a turn like the others since you don’t have to turn your beginning chain to then work row one. In this case, the “turning chain” is those chains skipped before making your first row 1 stitch. Working in the top of the turning chain means working in the top chain, so the one right after the last stitch you worked in. I figured it out. I don’t count the last one as a dc. The last one is the turning chain. Now I have to see why my count is wrong and I don’t have room for the 5 dc plus the 3dc on the turning chain. Thank you soooo much. I’m having fun puzzling things out and getting things right. You are so kind in answering my query so quickly. I wouod like to have the chart, please, it an international means to undestand the pattern…. Is there any way to alter this pattern for a scarf by any chance? This one has a fairly broad repeat, so might not look as you’d expect or desire. Also, ripples look different on the two ends. One repeat with a beginning chain of 29 will be 6-1/2 inches wide. Two repeats with a beginning chain of 63 will be 14-1/2″ wide. Do you have a chart to go with the written pattern? I keep messing it up somehow & thought perhaps a visual representation might help. I’ve been looking for a different wave pattern to teach friends at our church’s prayer shawl group, so once I master this I’ll share it with them. The small size is perfect for people in wheel chairs. Thank you for sharing your talent! Glad for the pattern you left for me and for you. I which u would make this projrct that I like since I don’t know how to read pattern. And let me know if u did and if is on u tube. Love to follow it seeing u doing it. I don’t have a video but do have a chart. It will be a while before I can make more videos. Just love this! Making for granddaughter in size medium. Question, if using 2 different colors, how would I determine row count per color change so overall color change is balanced? Thanks in advance for the help. I depends on what balanced means to you. Do you want to use the exact amount of two colors but have one color used both at the beginning and end? Or do you want equal sized bands of each color? Stripes are a preference thing and I’ve seen stripes done so many different ways. I’ve seen everything from equal bands to skinny bands of one color with wide bands of another color to transitional sized bands to gradually change the emphasized color from one end to the other. I love this pattern. I’m having a problem. My row ends are not coming out straight. It’s looking like a “V”. Please help. I’m trying to make this for a special friend in a nursing home. It will be a lapghan. Thank you. I don’t think I stated my question right. Is there a difference between row 1 and the other rows other than the fpdc and bpdc? It’s looking like there are more stitches with each row. Thanks. No difference. There are the same number of stitches each row. The increases are equally matched with the decreases. I love your patterns. Do u have a book showing these and other patterns that I could purchase or is it just online. I have only published patterns online. You will just keep repeating rows 3 and 4. I want to get back into crocheting again and I just love this pattern. If I were to use just 2 colors how much of each will I need? Also, what is the best yearn for this project? It depends on the size of the stripes. If stripes are all the same size, you typically will use the same color for the first and last stripe, so you will need slightly more than half of the total amount in that color. Hi, I have currently started this blanket and was wondering if I’m doing something wrong? My valleys aren’t flat like the peaks. Will this fix over time or will I need to block maybe? Thank you. Meaning the fabric is bowed? Or vertical height of the shell? I didn’t have to block mine. If you think something is going wrong with it, if you could send me a picture, I should be able to diagnose it. Hi, I really like your patterns! I am a beginner crochet-er but thought I’d give this pattern a shot. After a few tries getting the first row to come out right, I finally got it. The stitches on mine look very much like those on yours. I didn’t see the ripples at first but I thought they would come with more rows. I’m now on the 9th row and still no ripples. It is completely flat at the bottom. I like it still and don’t plan on changing it since I’m already 9 rows in but want to figure out what I did wrong. Any suggestions? If you don’t mind, send me a picture and I will see what is going on. I love all of your patterns. I’ve almost made all of them. I don’t know how I missed this great looking pattern. Going to try to make a twin size for a friend’s son. Can’t wait to get started. Thanks for all the beautiful patterns. I think this looks beautiful and would like to make it my next project. Could you please tell me which double crochet I should use. In the UK ours is different to USA. This is a USA double which is your treble. I’m making this blanket in the San Jose Sharks colors. How many rows of each color did you use in yours? I made 10 rows of each color for wide stripes. I’ve seen it made on Ravelry.com with just about every size stripe. I’m so elated to have stumbled upon your pattern. This will be my very first afghan.I’m on row 5 of a size small. I’d like to use three colors. How many rows of each color do you think I should do? I figured I could also divide 40 by 3 and crochet until I reach about 13 inches in height for each color. How would I measure this? Straight end sides? Measure along the side. You can make the stripes any size and it looks great. I’ve seen pictures posted on Ravelry.com with all kinds of stripes. What is your suggestion for yarn. I like cotton but am wondering if an acrylic blend is better for washing purposes and which type yarn would hold up better. Cottons will need gentler treatment for washing than the acrylics. Either will work well, it just depends on what will work best for your purposes. 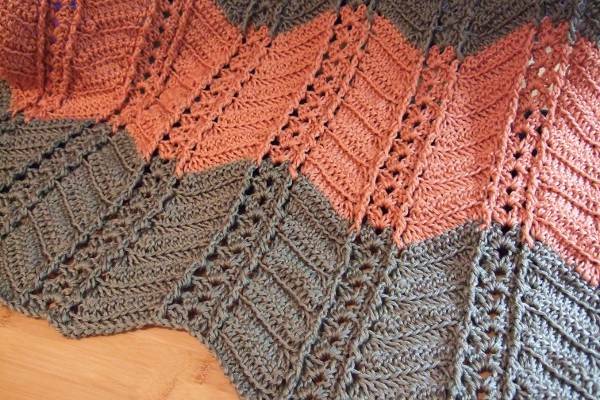 This pattern is absolutely gorgeous and I can’t wait to make it for our prayer shawl ministry. I’m having problems at the end of each row. When I put three stitches in the last stitch, my afghan appears to be flaring out. Am I looking at it incorrectly or am I doing something wrong? As long as you are not increasing the total number of stitches per row it should be counterbalanced by the decreases in the “valleys”. It may just be an optical allusion for the first few rows. Gorgeous! Will be following you n Facebook now. Beautiful skills. This is a beautiful afghan pattern! I can’t wait to get started on it. Thank you so much for sharing. You are truly gifted at crocheting. Hi I’m on my 4th row and I’m noticing that my edges keep expanding instead of staying straight. I think this is because of the 3dc at the end and the 2dc in the beginning of the row. Am I doing something wrong? The dc3tog should balance the 3dc to keep the same number of stitches in each row. Just make sure that there are consistently 5 dc between the dc3tog and the 3dc. Subsequent rows should help shape the ends so that they don’t look like they are getting bigger. I’m making this in the small-30″ width, and it is progressing quickly. Do you have any idea how many rows I should be shooting for? Its going to be a baby blanket, I can always just eye ball it but I’m used to following specific instructions. Still pretty new to the crochet world. A stroller blanket would need to be about 35 inches long so would be about 58 rows. A crib blanket would be longer. Could you please do a tutorial, I’m new at crocheting and I’m having problems with row 2, my stitches don’t seem to add up. I have that one on my list to make a video, but it will probably be summer before I have the time to start making videos again. If you can send me a photo of how it looks so far I may be able to determine the issue. I just finished this Afghan, I love it!!! I enjoyed crocheting it so much that I got carried away and made it big enough to fit my queen size bed!!! It’s beautiful!!!! Thank you for this lovely pattern. This is my second time making it. I would like to square up the two wavy edges. Before I spend a lot of time working it out myself, I wondered whether you had done it and could share? I haven’t done that. I would think the way to do it would be to add as many rows as needed of graduated stitches – slip stitch, single crochet, half-double crochet, double crochet and triple crochet – to build up to an even row. Thank you so much for the pattern. I’ve been trying to find patterns for specific yarn for all my grandkids. This was perfect for my grandson, and a very enjoyable pattern to crochet. Thank you!!!! 1. In most cases the stitches on top. The exception are the post stitches which are made around the posts of the dc stitches in the prior row. 2. It was the back loop when making the prior row, but when you work across the back side of it, it is the loop facing you. I am new with reading patterns. I usually do my own patterns. Do you have any patterns that are simple to read? Have visited your site from AllFreeCrochet,com several times and find your crochet work especially appealing. This pattern has texture that looks lovely and I imagine feels great. I love working with patterns that have a touchable, tactile feel to them. Will make a sample swatch and attach a folded 3×5 index card to identify the pattern & source and put it in my swatch basket so I have all the info when I need a new project. By the way, I do the same thing – change up older patterns to give them a new twist. And I never make the same afghan twice, there is always a major change so that each is a true original. When my creativity wans, I look for ideas from other crafts people, so I appreciate those who share their talents and projects. Thank you! Thank you so much for this lovely pattern. I was confused about row 2 and read several comments that seem to have the same problem. I think if your instructions read: Row 2: Ch3 (counts as a dc), 2dc in 1st dc…. it would eliminate the confusion about where the BPtr stitch should go and other stitches would fall in place. That is a great clarification. I made that modification at the beginnings of rows 2, 3, and 4.